If you are a music fan and can appreciate beautiful scenery you might consider heading to the lakeside community of Mulhurst on Pigeon Lake. Gathered for a two week retreat at the Historic Rundle’s Mission are some internationally recognized pianists, instructors, and high level students. Two years in the planning stages and coming to fruition this year is a festival new to Alberta called the Alberta Pianofest. The festival is an infusion of recitals by world class performers and a two week master class piano study session for twelve lucky 12-18 year old protégés. The festival runs from July 6-21st. 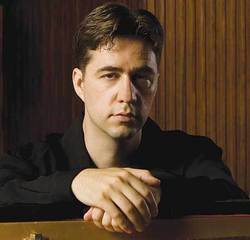 The festival features six piano recitals which includes names such as Pianofest founder Jason Cutmore, Rick Phillips, Robert Shannon, Stephane Lemelin and Ursula Oppens. The Alberta Pianofest & Young Artist Academy was founded in 2011 by pianist Jason Cutmore. Originally from Alberta and now residing in the New York area, Jason has taken a couple years of his busy professional life to put the Pianofest event together. Jason is backed by an impressive list of pianists, students, volunteers, board members and donors. The event has been a success so far if the previous four recitals are an indicator. The Stephane Lemelin recital was sold out and standing room only in the St. James United Church, Mulhurst last Saturday. Like a mid summer nights dream Stephane played works by Faure, Schumann and Beethoven. The atmosphere was surreal as a light wind flowed through the windows fluttering the curtains ever so slightly and the smell of fresh air permeated the church. Stephane’s performance was flawless and riveting. He also took the time to explain the artists thoughts and stages of life as they wrote their masterpieces centurys ago which further added to the experience. The goal of the Alberta Pianofest according to Jason is to “inspire and provide opportunity for accomplished young pianists through their daily contact with leading performing artists and teachers”. In doing this Jason has created an environment where he is able to “give back to the community and culture”. The professional recitals give the public a chance to see something they might not see in their lifetime. This is a win win situation for the public and the students. A typical day for the students involves a morning practice followed by some rec time like a walk on the beach and lunch. Late afternoon has the daily master class followed by supper and an evening of hanging out with their mentors. It is clear to me that 38 year old Jason Cutmore is a progressive thinker and is on to something special with his Alberta Pianofest & Young Artist Academy. Jason plans to keep this event going in the future with goals of expanding. This event has so far been a total class act with everything done professionally. Good job Jason and good luck the rest of the year with your piano playing accomplishments and travels. We hope to see this event for years to come.